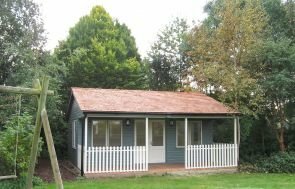 This country style Garden Room has been installed in our customer’s garden in Beaconsfield, Buckinghamshire to be used as an entertainment focal point for the customer’s friends and family. The Garden Room has a hipped roof, and this one has been covered in our construction-grade cedar shingle tiles to add a natural look to the building. The customer opted for white guttering, and this has been paired with a dual coloured paint coverage: the body of the building has been painted in a colour from our Valtti paint range and the doors, windows and corner boards have been painted in Valtti Ivory. The external cladding is weatherboard to give the timber a rough, rustic finish, and the windows are all Georgian in style. There are four sets of double glazed windows in total: a single window on each side of the doors, a double set on both gable ends, and all of them can be opened to allow plenty of fresh air inside. 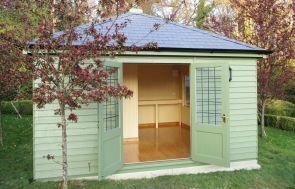 Inside this 3.6 x 4.8m Garden Room there is full insulation, an electrical pack with outside lights and a heater, a Natural lacquered floor, and painted matchboard lining on the walls in Ivory. All of our buildings are made in our Norfolk based factory from FSC® certified Scandinavian Redwood that we source from our partner sawmill in Northern Sweden. 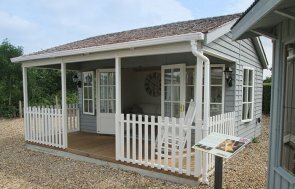 For more information about our handmade timber garden rooms, you can Contact Us online, or click the link below.